Combine the eggs, sake, soy sauce, salt, and pepper in a bowl and whisk gently to combine. Cut the chives into 2 inch strips. Heat the oil in a wide skillet over medium high heat. When hot, add the chives, and cook for one minute until the chives have softened. 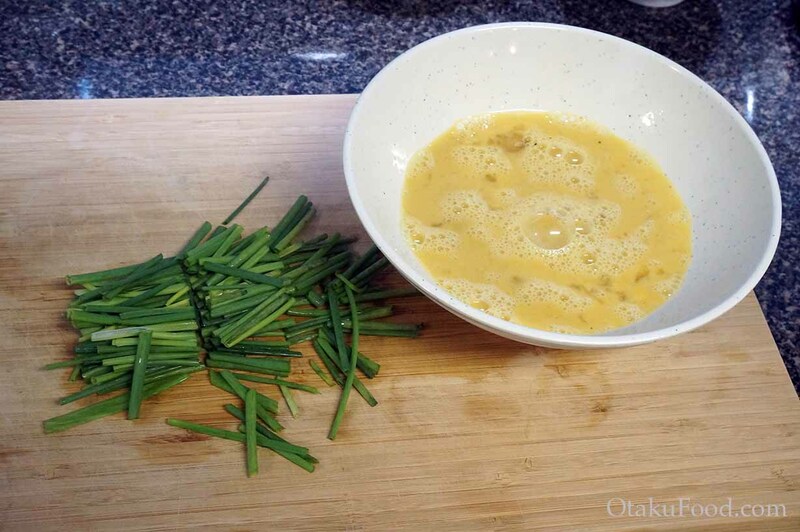 Once the chives have softened, pour in the egg mixture and stir gently to spread across the pan. Continue cooking the egg until it has just set, then remove from heat. Divide the rice into two bowls. 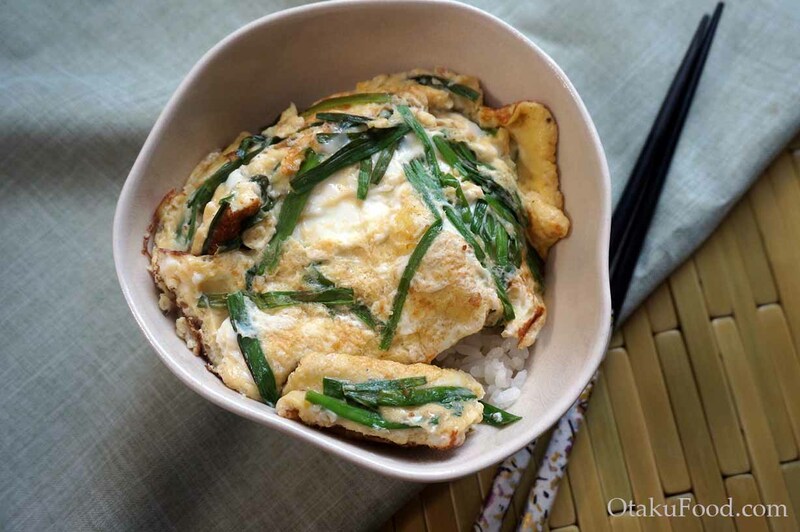 Cut the egg omelette in half and place on top of the rice to serve. 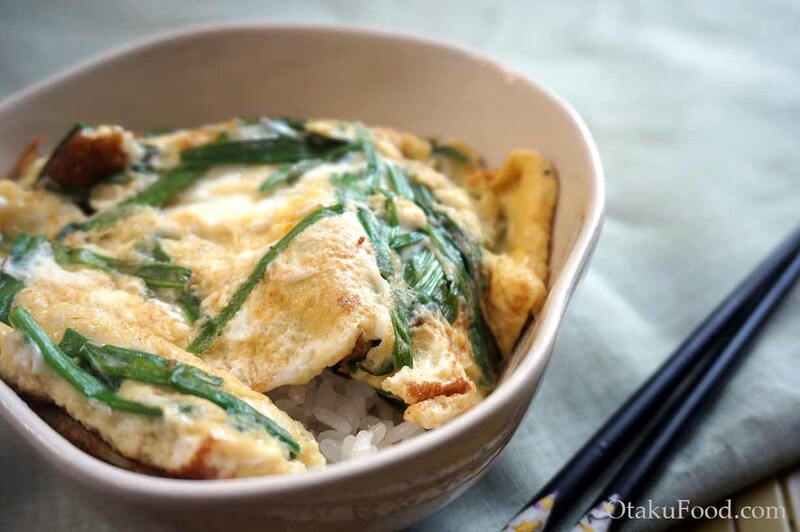 Light and fluffy eggs mixed with chives, this dish is Japanese comfort food at its finest. 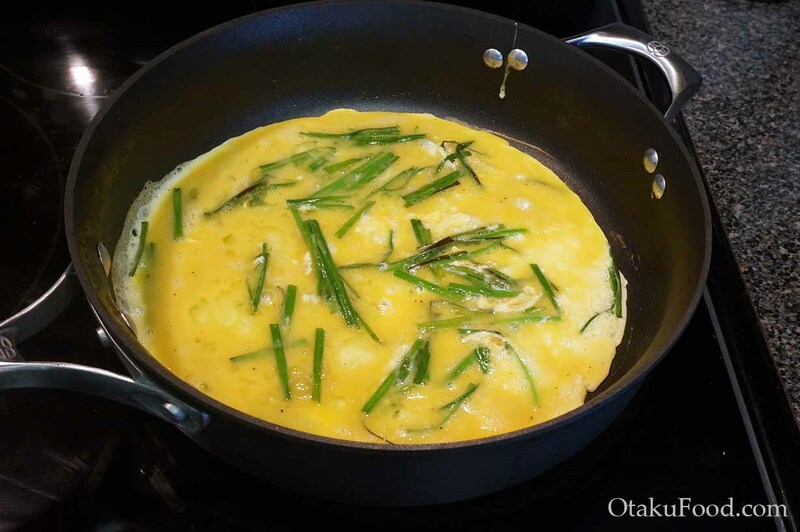 Traditionally served with rice, this Japanese style omelette is also great with toast! Quick to come together and very simple to make, this economical dish is great meal to add in to your recipe rotation! While we may think of eggs as breakfast in America, the Japanese don’t restrict eggs for just a morning food. Niratama donburi is usually served as a quick lunch of dinner, though of course, it would be an excellent breakfast too! Niratama is translated as garlic chives (nira) and egg (tama). The dish is delicious with just eggs and chives, but you can sometimes see some thinly sliced pork (buta) mixed in. Served in a bowl of rice, it falls into a category of Japanese cuisine called donburi, or don for short, which is basically a quick, one dish meal. There are many restaurants in Japan specializing in just one type of donburi, but sadly, you don’t see niratama don that often in restaurants! It’s more commonly made in the home, so this a great home cooked comfort dish to enjoy. 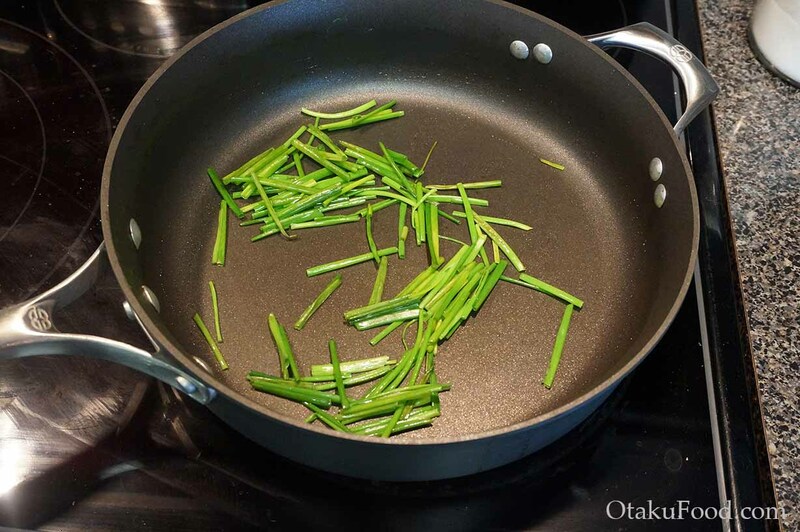 This recipe is traditionally made with garlic chives, an Asian variety with a light onion and garlic flavor, but you can use any variety available to you. I sometimes even use green onions if I can’t find anything else. While a really simple dish, the eggs do cook quickly, so be sure to pay attention and don’t overcook them! – Combine the eggs, sake, soy sauce, salt, and pepper in a bowl and whisk gently to combine. Cut the chives into 2 inch strips. – Heat the oil in a wide skillet over medium heat. When hot, add the chives, and cook for one minute until the chives have softened. – Pour the egg mixture into the pan and stir gently to mix in the chives. Continue cooking the egg until it has just set, then remove from heat. – Divide the rice into two bowls. Cut the egg omelette in half and place on top of the rice to serve.